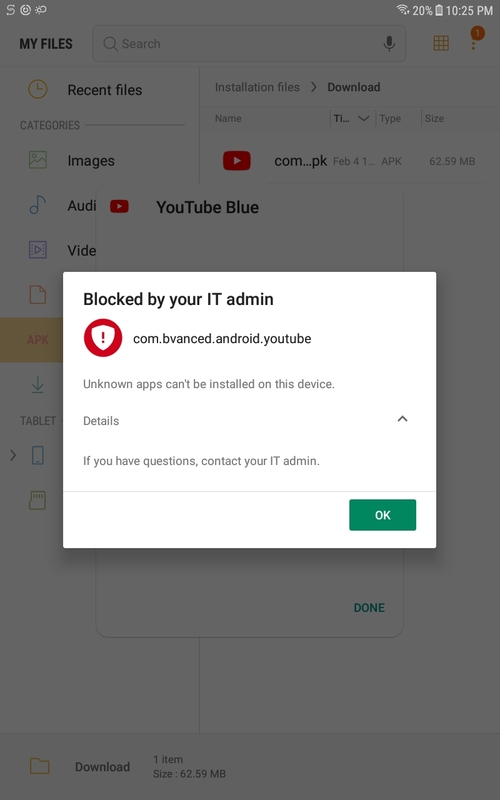 [SOLVED] How to get around block of unknown apps when &quot;unknown sources&quot; is enabled? [SOLVED] How to get around block of unknown apps when "unknown sources" is enabled? I just bought a Samsung Galaxy Tab A and I want YouTube Vanced on the tablet. But it won't let me install it because it's an "unknown" app. Yes, I have enabled "unknown sources" and it still won't let me install the app. A side note it's not blocking only YouTube vanced, it's blocking all unknown apps. What can I do to get around this? I turned off Play Protect & went to Settings > Security > More Security Options and cleared the credentials and was able to successfully install YouTube vanced and other apps! [SOLVED] Getting Android error message "App not installed"
[SOLVED] Install GMail 4.9 on 2013 Nexus 7 with Android 5 "Upgrade"
[SOLVED] Is there any way to install android app without having internet?